My church used to go camping. When I was little, probably just 8 years old, our entire church would drive out to the country, to a beautiful stretch of land owned by a sister church, and we would camp out. For a kid who grew up in the inner city, camping was quite the experience. There are several things that I can still remember vividly: the height of the trees, the morning fog, the smell of the ashes and embers left smoking from the previous night’s fire. And the stars. So many stars. I knew that our solar system was in a galaxy called the Milky Way, but I didn’t know that you could actually see the Milky Way from our planet. My view was always obstructed by the city lights. The sky of my childhood was mostly red, except for when we went camping. There, away from the buzzing street lamps and urban light pollution, I could finally see the night sky that my ancestors saw. I was filled with wonder. How far away were these stars? Did they have planets, too? Were they bigger and brighter than our sun? My imagination was kindled by the heavenly lights, which, even though they don’t appear to move, put on a far better show than anything I could watch on television. C.S. Lewis had this same sort of experience with the countryside of his native Ireland. He referred to the feelings that nature stirred up within him as Joy. It was as though something was calling to him from beyond the created order; a voice, perhaps, or a distant memory of someplace that he had never been but for which his heart deeply longed. I have come to believe that I am haunted by the memory of something that I have never experienced, but know beyond reason to be true. We are all haunted by the memory of a place where everything was good, true, and beautiful; a place untainted by the tragedy and suffering wrought everywhere by evil. There was a time before the world bent in on itself, unleashing this torrent of death. That place is Eden, and that time is the beginning. Like a specter haunting its earthly home, Eden wanders the hallways of our imaginations. Our hearts know that things are not as they ought to be. Something has gone horribly wrong, and as a result Eden’s gates have been shut and locked from the inside. We have been expelled, and there can be no going back, at least not by the old way. We have lost Eden, and our hearts won’t let us forget it. This memory has been burned into the human imagination. I sit on the beach, holding my son as he is slowly dying of a rare and fatal neurological disorder, and I’m longing for a place that we lost. I’m regretting the sin we committed that let things like Batten Disease enter the gene pool. When we lost Eden, we gained death—death in all its forms and by all its means. Even the slow, crippling death of a child. I want to run, to run back to Eden and throw open its gates. I want to carry my son to the Tree of Life, to lay him down under its shade and cover him in its leaves. I want to run with him through fields of grass untainted by the foolishness of humanity and build him a home in a land without idols. I want to go back to the place where we talked with God face to face, so that the Great [Re]Creator might breathe on him and HE WOULD LIVE! But I can’t. There is no going back. The gates of Eden are shuttered forever. The Tree is gone. Eden is lost. Every wistful desire, every indescribable longing—what C.S. Lewis called “Joy”—is misdirection. Our hearts ache for what we have lost and cannot regain. This is why all natural beauty is tinged with sorrow. A sunrise over the ocean fills us with awe but leaves us strangely empty. So, too, with a storm over the mountains, or the mist upon the rolling green hills on an early Irish morning. The earth reminds us of Eden, so we retreat to cities, congregating amidst the unnaturally straight lines of the structures we build, structures designed not to protect our stuff or our lives, but to protect our hearts from the pain of the memory of Eden’s loss. We have to go back and we cannot go back. We must press on. The only way to go is forward, to hope that somehow, we will stumble our way into Eden again, or perhaps into something fuller and better. Perhaps, even, someone will come to us to show the way. Would that God may light the way again, to throw open the gate, to sound the trumpet, proclaiming Eden open once more. Would that he might come to us, to speak to us, to invite us, to know us, to suffer with us, and perhaps, dare I say it, to die with us. To participate in this Unmaking which we have made. To capture it. To engulf it. To swallow it up forever. Yes, this must be the way. Not that we might find Eden again by luck or adventure or triumph, but that the One who inhabits the Original Eden, the Greater Eden, might come to us and speak to us in our exile. That he might bear our diseases and take up our infirmities. That he might even carry the burden of our sins, and in doing so, woo us out of our idolatry. Eden, after all, is only Eden because of the One who abides there, who met us there, who spoke with us face to face and walked with us in the cool of the day. The sting of losing Eden is not that we have lost the beauty of trees and mountains and rivers–those we still have aplenty–but that we have lost the beauty of knowing God. The power of the Tree of Life is not found in the fruit or the leaves, but in the arms of the One who prunes it. Oh, my heart, be wooed! Be wooed from your idolatry and lusts and deception and turn your face toward the One who is worthy, who is good, who is power wrapped in humility. Oh, my heart, be wooed! Be wooed by the One who can heal with a touch and raise the dead with a word. Oh, foolish heart, turn yourself to the One who turned to you, who looked for you in the darkness of this land of exile, who suffered for you and all your foolish and idolatrous brothers and sisters. Turn your face to the One who died, and in dying forgave all your sins; who rose again, and in rising swallowed up death forever. Oh, my heart, be wooed! Be wooed by the Bridegroom who pursues you with the ferocity of the purest agape. Be wooed, oh my heart, be wooed, because what you have lost in Eden you have gained a hundredfold in Jesus. It’s easy for me to lose sight of this, to think about what I’ve lost in Eden, what I could lose with Zeke, rather than focus on what I’ve gained in Jesus. Eden haunts me, but Jesus is with me. No, it doesn’t always feel that way, but there is a reality, a truth, that exists independently of what I feel or perceive, and at the center of that reality, defining it, incarnating it, animating it, is Jesus. Jesus offers you and me and all the rest of us far more than Eden ever could. Eden was a place from which God came and went; Jesus is a person, a man, who is God. He was God, is God, and will always be God. We know God through him, in him, and because of him. We see what God looks like, acts like, talks like, and loves like in Jesus. Everything about Jesus is God. There is nothing about Jesus that is not God. But sometimes my foolish and shallow heart is drawn to pretty things that shine and glow. My desires turn toward idols, toward that which promises what it cannot deliver. I try to find Joy in created things rather than in the Creator, the Sustainer, the Redeemer. The Joy is not in the mountains; the Joy is in the One who treads the mountains. The Joy is not in the ocean; the Joy is in the One who filled the Ocean and sees its depths. All that we have lost in Eden, and more, is found in Jesus. But he isn’t flashy. He isn’t urgent. He doesn’t shine or glow. He is patient. He is strong. He is brave. He is power wrapped in humility. He is agape love clothed in tenderness and strength and empathy and holiness. He loves and he loves and he loves and he haunts your heart, wooing you, calling to you. “Return to me! I can give you Eden and so much more! I can give you myself, perfect goodness and purest light and strongest love.” In losing Eden, do not lose yourself. Find yourself in the One who passed through death to find you. The first chapter of Genesis is the most hotly contested biblical text of our time. Theories and interpretations abound as scholars have turned the chapter upside down and inside out looking for biblical clues (and ammunition) to the origins of the universe. There are at least four major schools of interpretation on Genesis One: young-earth creationism; day-age theory; the gap theory; and the literary hypothesis. It’s time to add a fifth school to that list: John Walton’s cosmic temple inauguration. Crossing this cultural gulf means making one significant, and seemingly obvious, proposition: Genesis 1 is ancient cosmology. (16) This means that “it does not attempt to describe cosmology in modern terms or address modern questions.” (16) What, then, are the terms in which it describes cosmology? This is the crucial question, and what sets Walton’s interpretation on a different course from the others. Moderns tend to think of creation only terms of material origins. What is the sun made of and how did it come into being? How long did it take for the mountains to be formed and how did they get their current shape? What is the physical composition of humanity and how did we get to be the way we are now? These are the questions of a modern, Enlightenment-oriented culture. But these are not the questions of a polytheistic culture, or even a monotheistic culture within a wider polytheistic world? 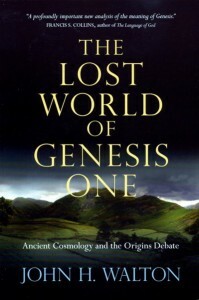 In order to understand Genesis One, we need to ask the questions the ancients asked. The implications of this interpretation are numerous., but I will only mention two. First, if Genesis One is an account of functional origins rather than material origins, there is no conflict between a “literal” reading of Genesis and the findings of evolutionary science. (Walton argues that the real fight between the creation (and ID) camp and the evolution camp is over teleology, and he makes some interesting prescriptions for public scientific education.) Second, if the cosmos is God’s temple (or divine resting place) then there are no such things as natural resources—there are only sacred resources, and we must adjust our ecology accordingly. Walton’s book offers valuable insight into the Genesis One debate, and ought to be carefully examined by those on all sides. There is much more in the book that is worthy of discussion, and it is accessible enough to encourage conversation between all interested parties. 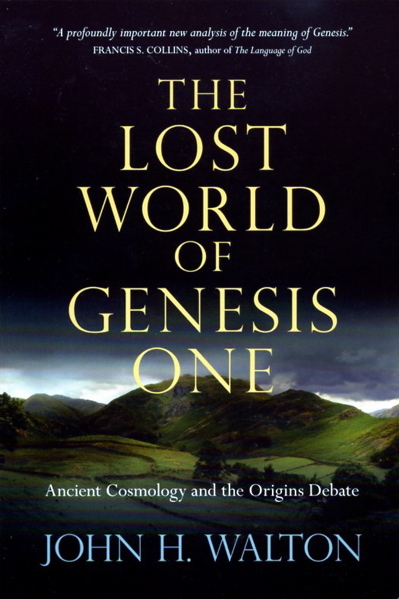 Questions: Does Walton present a reading of Genesis One that allows Christians to remain theologically and exegetically faithful while being scientifically relevant? Do you find the argument of functional ontology convincing? How does this interpretation change the game on cosmic origins?